Rhino Shelter is known for creating and manufacturing sturdy and portable shelters for just about any type of cargo you can imagine. 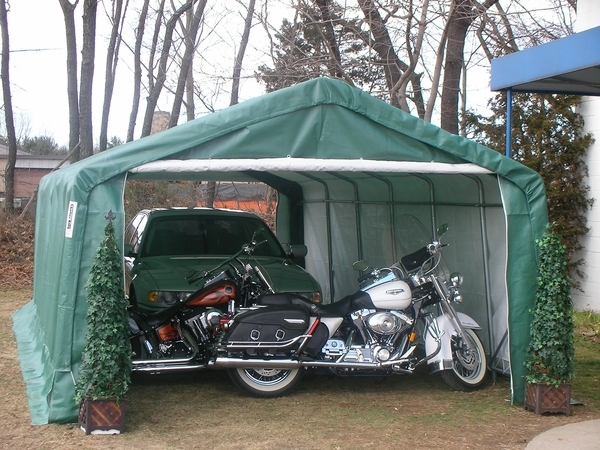 This instant house style garage can be put up used for additional storage. The galvanized finished corrosion free steel frame is all ready to be set up in an instant. The polyethylene fabric cover has heat welded seams and is reinforced at the vulnerable spots. The fabric is fire retardant and UV protected. * Please Note: Shown In Green. Arrived in 3 cartons, complete with instructions. Assembled with 2 people, total time about 4 hours... nice looking shelter, good product.